Serving trolleys with a massive stainless steel construction, are commonly manufactured in the version with two or three shelves. Each trolley shelf has pressed raised profile edges. The customer can also choose a type with or without a handle. The trolleys are equipped with wheels with a diameter of 125 mm with or without brakes, and thanks to the single-screw connection, the wheels easily replaceable. There are 360° swivel wheels. Serving trolleys are welded, which ensures high strength and load-bearing capacity. Each trolley passes through an output control to ensure its quality. 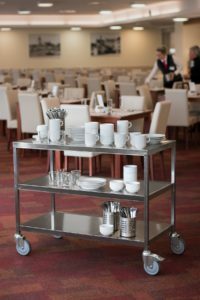 Due to their features and the precise manufacturing, our stainless steel serving trolleys offer a long service life and are ideal for everyday use in professional kitchens, canteens, restaurants, and other mainly gastronomic establishments.